Most people believe kids aren’t capable of learning advanced skills or furthering their careers at a young age, but Amber Kelley is another amazing kid that proved that wrong! Amber Kelley is just one of these kids that was brave enough to tap into her potential early in life. Amber has been cooking and appearing on television before the age of 10. Featured as the “Culinary Wizard” on E! Of her many successes, Amber was also honored to be a “Kid Coach” at Mashable’s 2016 Kid Talks. Kid Talks is an event in which other highly successful kids like Amber encouraged adults and kids alike to dream fearlessly. Amber had already been taking the culinary world by storm when she won the first season of Food Network Star Kids at the age of thirteen in 2016. As if that wasn’t enough to make any parent proud, shortly after Amber was awarded her very own Food Network web series. 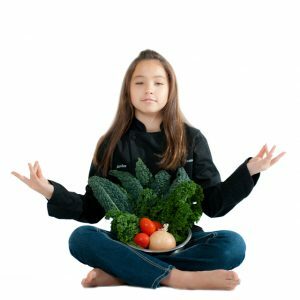 In her web series, Kids Menu Makeover, Amber reinvents recipes inspired by all- star chefs like Alex Guarnaschelli and Dale Talde, and then has the privilege to cook her kid-friendly recipes alongside them. She is also the proud owner of her YouTube channel entitled, Cook with Amber, which she debuted in 2012 at age 9. In her first video Amber is soft-spoken as she make a delicious Greek salad with homemade dressing. But you can see she’s obviously a natural in the kitchen. On her channel, Amber posts videos of her making some of her favorite healthy family recipes. She is occasionally joined by her friend and celebrity chef Jamie Oliver, who helps her create delicious recipes such as crunchy rainbow coleslaw and healthy chicken nuggets. 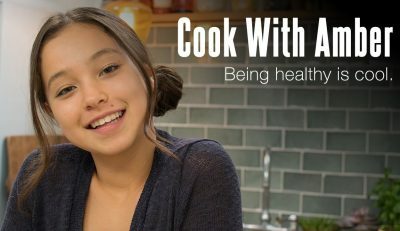 In addition to her YouTube channel, Amber also has her own website and blog where she posts videos, recipes, and healthy challenges all in an attempt to spread her message that “being healthy is COOL”. One of her most recent recipes is a refreshing mango raspberry coconut sorbet, which is the perfect for the upcoming hot summer months! Amber’s mission of spreading a healthy lifestyle began after she was bullied in the second grade for having healthy home-packed lunches. She was different in school because she chose to go against the “cool” crowd who ate processed and packaged foods. “You’re younger than me and I love cooking/baking too! You are an inspiration to many others” (Estiee C). Amber Kelley has quickly become an inspiration all around the country and she’s barely even a teenager. I think adults should take a lesson from this outrageously talented and dedicated young girl: that kids are just as capable of changing the world as adults are. So let’s give Amber Kelley, and all the amazing kids in the world, a big round of applause for continuing to do what they do!